I have heard so many different thoughts on this book, from the bad (too much like Cinder, and not as good) to the awesome. So I had no idea what I was going to think when I started reading it. I am happy to say that I thoroughly enjoyed this fun, heartwarming, fast-paced Clockwork Cinderella retelling very much. I look forward to seeing what else Betsy Cornwell brings to the table! 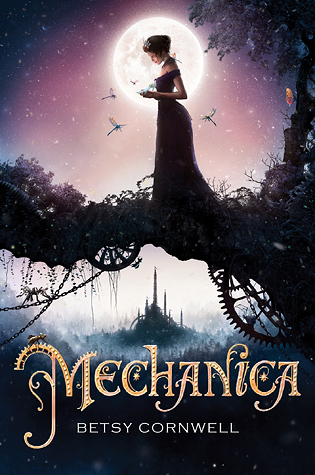 I am really hoping that it will be Book 2 of Mechanica! My favorite part was absolutely Jules, the clockwork horse, and all of his clockwork insect minions. They were amazing creatures, and the descriptions were so perfect. All i could think the whole time was, I WANT A JULES! If only... Nicolette, otherwise known as Nick and Mechanica, was another favorite part of the story. She was a wonderful MC. Determined and willful, she had a strong mind and a strong body. She fought for her dreams, and she succeeded. She put up with so much hate and bullying from her stepmother and stepsisters, but she doesn't let it keep her down. I genuinely enjoyed her. Nick, after sneaking out of the house one day, meets Caro and Finn. They become fast friends, and I loved these two so much. They were both great secondary characters. Caro was loud and boisterous and fun, and she loved so strongly. Finn was loyal and kind, even when he was hiding who he really was. There was some romance in the story, but not the kind you might be expecting. Still, I thought it added an interesting dynamic to the story overall. The only issue that I had with Mechanica was that I wanted MORE! I wanted to know more about the world, the Fae and their awesome magic. I wanted more of Mr. Candry. What I really want is another book. The ending left me hopeful that there might be a sequel, and if there is it will make me a very happy woman!